UPDATE: You can now find the recipe for the 12 inch version of this cake right here. 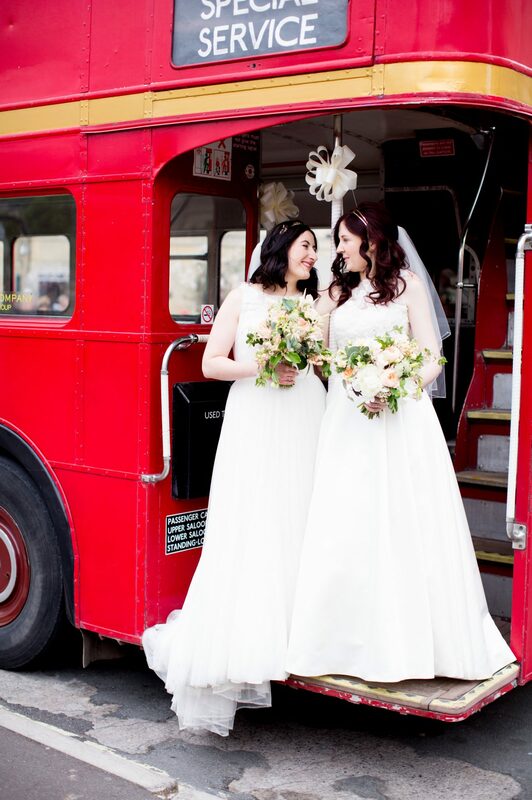 One year ago today, I got married. It was an incredible day, and we are spending our anniversary watching our wedding video, filling in our new wedding anniversary journal, and eating the mini replica wedding cake I have been making this week. And that’s where today’s recipe for my almond layer cake comes in. It is the very same recipe that made the 12 inch bottom tier of our beautiful wedding cake (which I made myself), but today I’m going to share with you the recipe for the 8 inch version. Because, 12 inches is too much cake for anything but a wedding, lets face it. The first wedding anniversary is paper so as well as the wedding anniversary journal, I am also gifting her this Harry Potter quote print (in white and gold, not blue), this gorgeous gin cocktail book (cocktails were a big part of our wedding day, and Kate absolutely loves gin), and some homemade crepe paper flowers… if I ever get round to finishing them. I’m definitely keen on keeping up the traditional wedding anniversary gifts, and am already thinking of cotton-based gifts that I can get for her next year. But I’m obviously keeping my cards close to my chest on that front. But, back to the almond layer cake. That’s what you’re all here for after all. This cake is bloody gorgeous. I had been trying out a few different potential wedding cake flavours before I stumbled upon this recipe, and as soon as I’d baked it I knew it was the one. 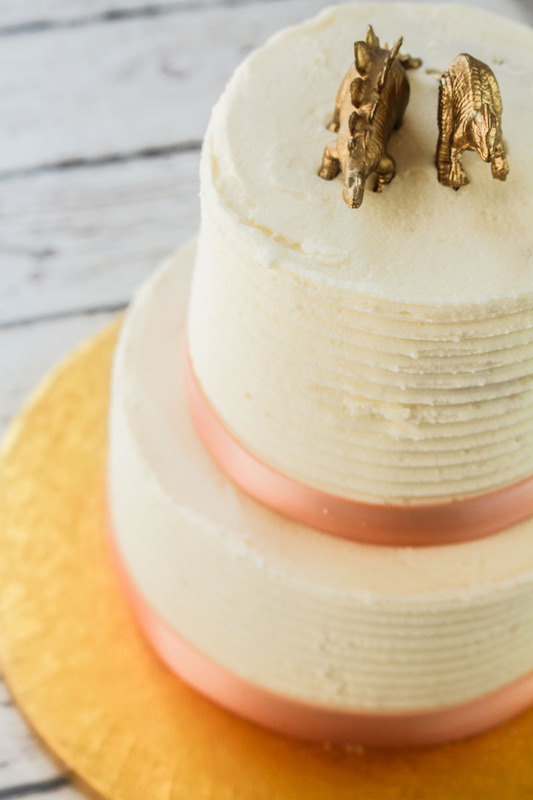 I’ve adapted it into a three layered cake, because I always think that taller cakes are so much cuter – and much more suitable for a wedding or celebration cake. I also subbed out the cake flour (because that’s not even a thing in the UK) and smothered it in my very own light and fluffy almond buttercream. There are a few things that make this recipe a little bit special. Firstly, there’s the sour cream. If you’ve been around here before, you might know that I absolutely love to put yogurt in my cupcakes. It adds moisture and flavour, and turns a normal cupcake into something a little bit special. I swear by it. But when it comes to a layer cake, I find that sour cream makes things a little more sturdy, whilst also keeping the cake moist and light. It’s pretty much magic. The method might look a little weird too. It’s called the ‘reverse creaming’ method, and is pretty much a gift to layer cakes, especially when stacking one on top of the other. I’m no scientist, so I can’t tell you why, but it just seems to make the cake have a denser texture – but not in a bad way. If you are after a cake that is super light and fluffy, and falls apart on your fork, then this 100% isn’t the guy for you. But, if you want something that holds up well to stacking, and is super great to frost, then keep reading. The almond flavour comes from some almond extract – I used this Nielsen Massey one – and that’s it. There are no actual almonds in this cake, it just doesn’t need the extra moisture. It’s perfect just the way it is. You could definitely add some toasted almonds to the outside of the cake if you wanted, but I’ve kept mine true to my original wedding cake. The pictures today show my mini wedding cake, which was a 4 inch cake stacked on top of a 6 inch cake. If you want to do this, then use the same quantities for the recipe below, which will make three 4 inch layers, and three 6 inch layers. You might need a little bit more buttercream than for an 8 inch cake though. 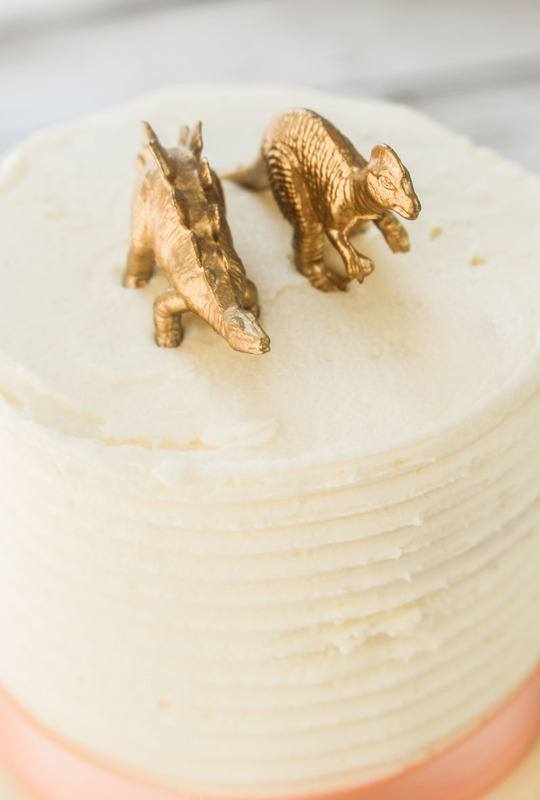 If you’re wondering about the dinosaur cake toppers, these were the favours that were on the tables at the wedding. Each person had their own little gold dino, which I sprayed gold in my parents’ garage last year. The actual wedding cake also had some bigger dinosaurs on top too – but they would have dwarfed my cute little anniversary cake. So I stuck some of the little ones on here instead. The almond buttercream here is based on my usual vanilla buttercream recipe, but with some almond extract. Of course. You could definitely use some vanilla buttercream here, or even the raspberry buttercream from my raspberry champagne cake. We’re going to stick with the almond today though. Keeping things classic. I made the pattern around the edge of this cake with an icing scraper, but you can keep things plain, or just use a palette knife, or maybe a fork, to try and achieve a similar look. However you normally like to decorate your layer cakes is good with me. Here’s to another happy year of marriage ? The perfect almond layer cake, filled with almond buttercream. Perfect as part of a wedding cake, or on its own for a birthday or christening cake. Preheat the oven to 180°C / 355°F (160°C fan), and grease and line the bottom of three 8 inch round cake tins. Set aside for later. In a jug or small bowl, combine the eggs, vanilla extract, almond extract, milk, and sour cream. Beat together with a fork - it will look lumpy and weird, but that's okay. Set this aside for later. Sift the flour, cornflour, and baking powder into the bowl of your stand mixer. Add the sugar and salt, and then whisk together. Put the mixer on a low-medium heat, and add the butter into the bowl, one cube at a time. Keep beating until all the flour has been incorporated into the butter, and the mixture looks like breadcrumbs. Scrape down the sides of the bowl. Put your stand mixer on a low speed, and slowly add half the sour cream mixture into the bowl. Turn up the speed to medium, and beat together for a minute or so, until smooth. Scrape down the sides, then put the mixer back on low, and add the remaining sour cream mixture. Beat for 30 seconds or so on low, until the sour cream mixture has been fully incorporated. Pour one third of the batter into each of the three tins, and then bake for roughly 35 minutes, or until a skewer or toothpick inserted into the middle of the cakes comes out clean. Leave to cool in the tins on a wire rack. Once the cakes are cool enough to handle, remove from the tins and leave to cool completely. Place the butter into a large bowl, and beat with an electric whisk until light and fluffy - at least three minutes. Add the icing sugar in three separate additions, beating well between each addition. If the buttercream seems too thick, add milk a tablespoon at a time until the right consistency is achieved. Add the almond and vanilla extracts, and beat again. Trim the top of the three cakes so they are flat and even, and then sandwich them together with the buttercream, on top of an 8 inch cake board. Cover the cake with a thin crumb coat of buttercream, and then pop in the fridge to chill for an hour or so. Once the crumb coat is firm, add the remaining buttercream to the cake and cover evenly. Scrape the sides with a textured icing scraper, or use a spatula to make a ridged effect. A turntable will make this process a lot easier, so use one if you can. Decorate as you wish. The cake will stay fresh for 3-4 days if stored in an airtight container in a cool place. Do not store in the fridge, as this will make your buttercream sweat. The individual cakes can be baked in advance and then frozen. Wrap them individually in clingfilm or plastic wrap, and pop them in the freezer. To defrost, leave them unwrapped at room temperature for 4-6 hours, or overnight. This cake is amazing because it feels really moist and sort of dense in a light way? I don’t even know. But it is fantastic. I love it when you write about our wedding.. probably because I love our wedding. I also love you. Maybe even more than gold dinos. Hi! I am looking into almond cake recipes for some brides-to-be friends whose wedding is in August. 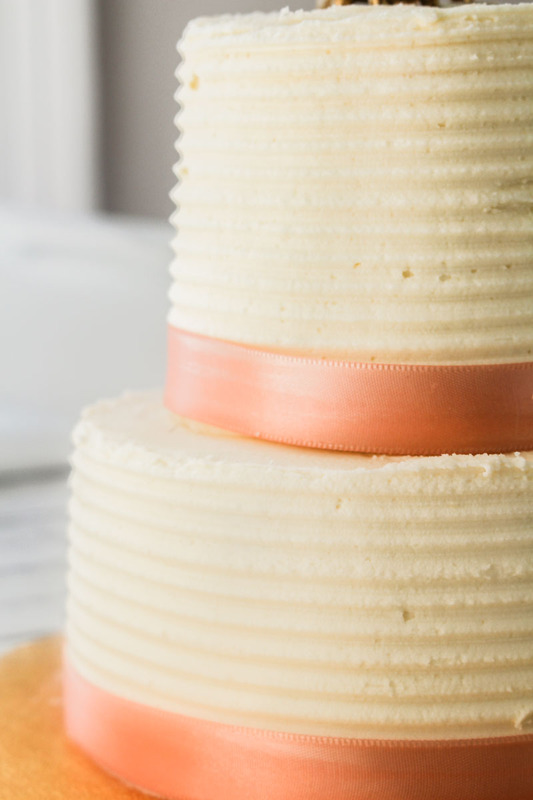 Would you be willing to share the big recipe for the large wedding cake? If so, that would be wonderful! I will do! I’ve had a couple of people ask for it, so I will post it this week ? Sorry – it should be added with the flour. I have updated the recipe! Thanks for letting me know 🙂 Hopefully it hasn’t made a massive difference to your cake, apart from that the cornflour should make it a little fluffier. love this – and am making it for my kid’s birthday! as with other buttercreams – can i make this one a few days in advance & keep it in the fridge? Thanks Molly! You can definitely make the cake a few days in advance (keep it in an airtight container somewhere cool) and also make the buttercream in advance (keep it in the fridge as you suggested). Once the cake has been covered in the buttercream then I wouldn’t advise keeping in the fridge. It will be fine if kept covered somewhere cool. The buttercream will keep the cake inside safe. Any more questions then let me know ? I hope it turns out well! awesome – you’re the best!! your recipes always turn out amazing. Would the buttercream be okay to use to pipe flowers? Hi Tiana – you should be able to pipe flowers like you would with any other buttercream. Make sure the frosting is the right consistency – too stiff and it will be difficult to pipe neatly, and too soft and it won’t hold up. You can make it stiffer by adding more icing sugar, or softer by adding a drop or two of milk. Hope that helps! This cake was awesome. I researched cake recipes looking for the perfect cake to make for an anniversary party, and settled on this one. It was a huge hit with everyone. It’s the first cake that I wasn’t able to take home leftovers. I made this cake for my daughters baby shower. Perfect dense, moist cake. I am very finicky when it comes to cake. It must be dense with a nice crumb, moist and in no way fluffy. Your recipe was spot on. I used 2 8″ and 2 6″ to create a tiered cake. Doubled the buttercream and used every bit. Darn amazing recipe. Adding it to my forever file. Thank you so much Judy! I hope the baby shower was just as much of a success as the cake! ?